Isn’t it hard to believe that 2015 is nearing its end? It seems like just yesterday we were all counting down to the new year and saying goodbye to 2014. Where does the time go? While there are many things to worry about and accomplish as this year closes out, one of the things that your nonprofit should prioritize is taking advantage of the matching gift programs that businesses offer their employees. Matching gifts can take your organization’s fundraising efforts to the next level and can double or sometimes even triple the amount of donations that you receive. Nearly a quarter of all donations made by individuals over the course of a year are made between Thanksgiving and New Year’s. If your nonprofit receives a significant amount of donations as the temperatures drop, why not put forth a little extra effort to market matching gift programs to your donors? While some donors’ companies may keep their employees in the loop about the matching gift programs that they offer, many donors have no idea that the companies they work for can help them double their donation. As we say goodbye to 2015, make sure that your donors’ year end gifts reach their full potential. Many donors who want to know more about your nonprofit will go to your website first. If they wish to make an online donation, you can help them maximize their donation by reminding them to look into their employer’s matching gift programs. WNET Thirteen demonstrates how your nonprofit can encourage donors to look into matching gift programs. Donors who land on the “Support Thirteen” page are prompted to find out if their employers will match their donation. By keeping the information fresh in donors’ minds, you can help ensure that more contributors will have their donations matched. If your nonprofit has a large following on social media, use it to your advantage! While you have holiday updates and college football posts to compete with, your nonprofit can still benefit from marketing matching gifts on social media. Camp Kudzu does a great job of letting followers know about matching gifts for year-end donations on their Facebook page. The post is short and to the point and provides donors with a link that will help them find out more about matching gift programs that will help their donations go further. You can also use your email or regular mail newsletter to get the word out about matching gifts to appeal to end-of-year donors. People want to know what your organization is up to, and those who regularly peruse your newsletters will be informed about matching gifts at the perfect time of year. 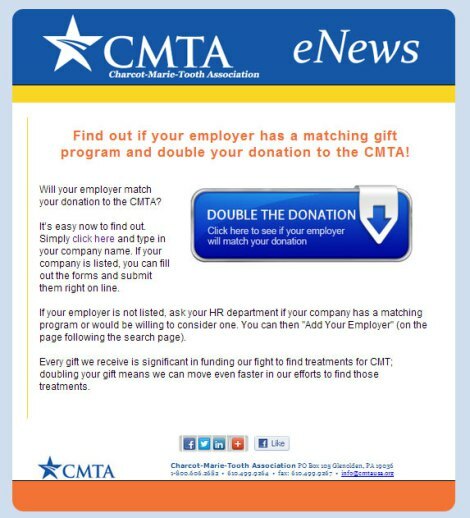 The Charcot-Marie-Tooth Association’s eNewsletter provides donors with to-the-point information about matching gifts and encourages them to find out more by giving them multiple links within the newsletter. They also remind donors about the organization’s cause along with links to social media sites. Marketing matching gifts to your donors doesn’t have to be complicated. Use the resources that are already at your disposal to maximize donations at the end of the year. In order for your donors to have their contributions matched, they have to submit paperwork or submit a request online. However, corporations all have different deadlines and processes for their corporate giving programs. Whichever deadline your donors’ employers implement, you should be reminding donors to have their donations matched as soon as possible. If donors’ employers only accept matching gift requests through the end of the calendar year, you’ll want to remind donors more frequently of matching gift programs in November and December to ensure that their donations go twice as far. Your organization is likely already tracking a wide range of metrics but you should consider putting together a few matching gift metrics as well. Knowing how much your organization is bringing in from matching gifts as well as the percentage of donations which get matched year over year will help ensure your team is staying focused on matching gifts. If you want donors to continue to give in 2016, say thank you for the donations they made in 2015! Nothing is more rude than not being appreciative of a gift of any kind, but it’s especially tactless to let donations and matching gifts go unthanked. As soon as donors’ contributions are made, send them an email letting them know that you received and appreciate their donation. The Piedmont Foundation does an excellent job of thanking donors for their initial donation while also reminding them of matching gifts with the use of multiple links. While this email could be sent out at any time of the year, it’s vitally important to remind donors of matching gifts at the end of the year. In addition to thanking donors for their contributions, make sure you’re letting them know that their employers’ matching gifts came in. When donors know that their initial donation was matched, they are more likely to have their 2016 contributions matched. Here is an example email that NC State University sent to a donor thanking them and informing them that their employer’s matching gift came in. Sending out emails like this can be a great way to keep donors giving once 2015 is in the past. For other ways to ensure that donors continue to give next year, check out this resource. Another good way to remind donors of matching gifts is to thank them for all of the donations they made in 2015. Letting donors know that you appreciate their continued support can be the stepping stone you need to get them to submit matching gift requests to make the most of their donations. As we say goodbye to 2015 and usher in 2016, make the most of your donors’ charitable moods. Because most donors tend to give in the last couple months of the year (and a third of December giving occurs on the last day! ), it’s important to keep donors informed about matching gift programs. By effectively marketing matching gifts on your website and on social media as well as in your newsletter, being aware of matching gift deadlines, and thanking donors, you will be able to make the most of the donations that you receive all year round and can successfully begin the new year! Learn more about end-of-year fundraising. The preceding post is by Adam Weinger, President of Double the Donation, the leading provider of tools to nonprofits to help them raise more money from corporate matching gift and volunteer grant programs. Connect with Adam via email or on LinkedIn.